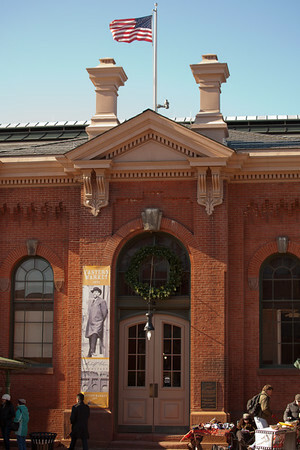 Brauhaus Photo of the Day: January 15, 2012 - Eastern Market Washington DC. January 15, 2012 - Eastern Market Washington DC. Ran down here this morning for a bit of shopping. Am a fan - and am glad that it has been revitalized after the fire several years ago. Picked up a few bits of this and that - chili makings, lemons for Caesar dressing, and shrimp to steam for dinner. Today was colder and windy. Not as many folks outside, but still everything was well attended. They've torn down the temporary structure that was used while the market was being rebuilt. Only wish is that parking were easier to find. Sunday shopping - didn't have to pay a meter. Tons of history in this place. It was used as a hospital during the civil war. Photo details: Canon 5dII, handheld, natural light. 70mm focal length. ISO 100, 1/100th @ f/5.0. Retouched with Lightroom - mostly just color balance and overall exposure. No real cropping, though straightened up the frame slightly. Critique: This probably deserved more of a wide angle than I shot here. Framing is a bit odd - almost too tight. Was fighting to keep the top of the flag pole and the people's feet in the frame at the same time. Was shot mid-day, which isn't usually conducive to a great angle of light. It is just past mid-winter and the sun is at a fairly low angle. That gives a bit of drama, but also created some odd shadows.